is linked in all its richness to the history, geography, demography and culture of the land. 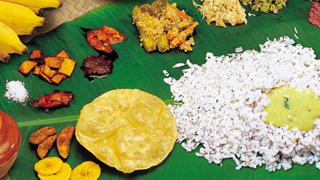 Kerala cuisine has a multitude of both vegetarian and non-vegetarian dishes prepared using fish, poultry and red meat. Mango Pickle This video shows how to cook Mango pickle, a Kerala vegetarian side dish. Any true-blue Malayali can say manga achar – that’s mango pickle – without a feeling of overwhelming desire washing over him. The combination of spiciness, saltiness and sourness of this pickle is delightful. Method of preparation Boil some water in a pressure cooker. Now mix the grated tapioca with puttu podi (rice flour) by adding salt. No need to add water. After mixing, keep the contents aside. When the pressure cooker starts letting out steam, place the puttu maker on top of the pressure cooker; fully covering the outlet of the steam nozzle. First put some grated coconut into the puttu maker and on top of it add some puttu podi (rice-flour) – kappa (tapioca) flour mixture. Allow the steam to cook for about three minutes. Now remove the puttu-maker from the top of the cooker. Serve hot. 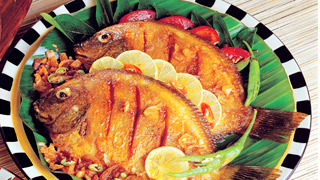 Relish your Kappa Puttu ideally with fish curry or chicken curry. method of preparation Parboil the ada and drain the water thoroughly. Make syrup with jaggery, water and strain through a muslin cloth. Add the ada to the syrup and cook it well. Add the coconut milk, cardamom powder and just heat but do not boil. Finish with fried sultanas, cashew nuts and coconut. Method of preparation Clean tapioca and dice. Wash thoroughly and boil in water. Drain off excess water from cooked tapioca. Add salt, ground coconut, green chilly and turmeric. For tempering, heat, oil and crackle mustard seeds, brown small onion slices and curry leaves. Put these over the stirred tapioca and serve hot. Do you like to any of these special dishes ?